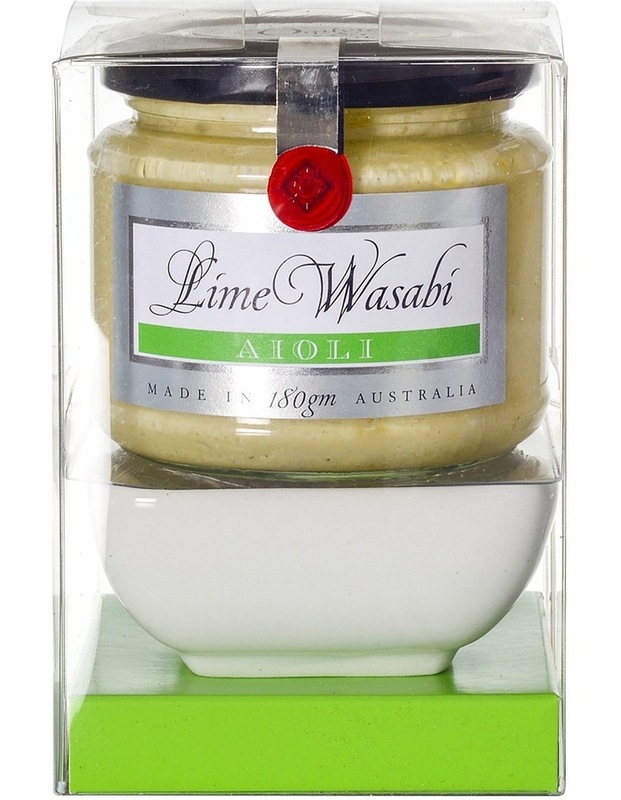 Beautifully packaged with a ceramic dipping bowl, Ogilvie & Co's Lime Wasabi Aioli is a gourmet condiment that features the subtle taste of real wasabi. With a light and clean flavour on the palate, we combine it with lime to create a delicious aioli which is truly versatile. Serve with potato wedges or as an alternative to traditional seafood sauces. Ogilvie and Co are an Australian family-owned manufacturer of gourmet food products founded in 1987 in Perth, WA. Since its humble beginnings operating out of a vacant corner butcher shop Ogilvie & Co has grown to become one of Australia's leading manufacturers in the gourmet food industry. Hand made using traditional preserving methods, Ogilvie & Co has a constantly evolving range of product known for its high level of quality, presentation and signature red seal. Soybean oil, egg yolk, water, whole egg, vinegar, sugar, salt, lemon juice, wasabi paste (4.5%)( wasabi rhizome (80%), grapeseed oil, lemon, citric acid, salt), natural mustard flavour, garlic, lime zest (1%), preservative (385), spices. Contains egg & soy. Manufactured on premises that handles Peanuts, Tree nuts and sesame seeds.